Chamerion angustifolium (formerly classified in the genus Epilobium), commonly known as fireweed, great willow-herb, or rosebay willow-herb, is a perennial herbaceous plant in the willowherb family Onagraceae. It is circumboreal and native throughout the temperate Northern Hemisphere, particularly in boreal forests habitats. Two subspecies are recognized as valid: C. a. angustifolium (more northerly and tetraploid), and C. a. circumvagum (more southerly and diploid). 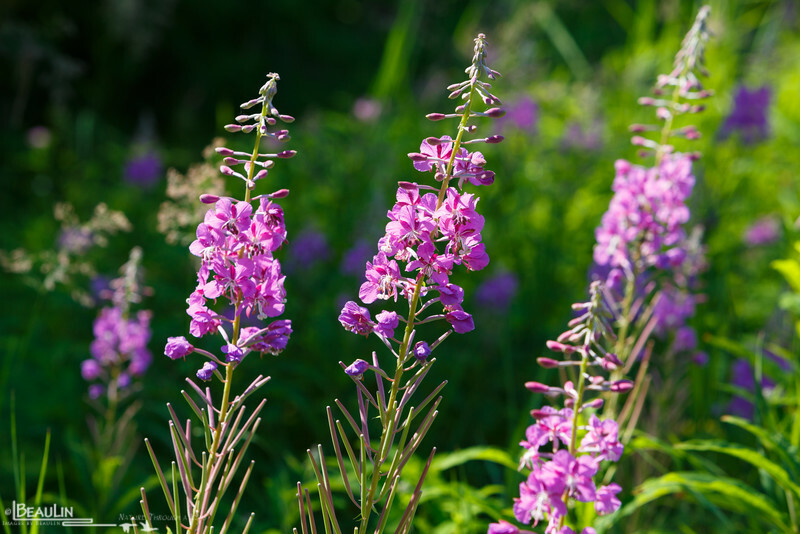 Fireweed's natural variation in ploidy has prompted its use in scientific studies of polyploidy's possible effects on adaptive potential and species diversification. This herb is often abundant in wet calcareous to slightly acidic soils in open fields, pastures, ditches and other disturbed areas, and particularly burned-over lands. In fact, the name fireweed derives from the species' abundance as a colonizer on burned-over sites. Its tendency to quickly colonize open areas with little competition makes it a clear example of a pioneer species. Plants grow and flower as long as there is open space and plenty of light. As trees and brush grow larger the plants die out, but the seeds remain viable in the soil seed bank for many years; when a new fire or other disturbance occurs that opens up the ground to light again, the seeds germinate. Some areas with heavy seed banks can be covered with nearly pure, dense stands of this species after a burn and when in flower the site is turned into field of color. Pollinating insects are readily attracted to blooming fireweed. When picked at the right time and properly prepared soon after picking, the leaves are a good source of vitamin C and pro-vitamin A, and can be eaten raw or used as a tea substitute. In Alaska, candies, syrups, jellies, monofloral honey, and even ice cream are made from fireweed. Fireweed was also used medicinally by Native Americans to treat pus-filled boils. In addition to the leaves, the root can be roasted after scraping off the outside, but often tastes bitter.